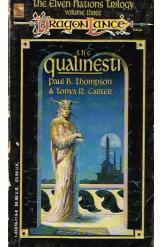 DragonLance: The Qualinesti by Paul B. Thompson and Tonya R. Carter, Sci Fi. Book is in good condition, all pages intact. The fabled stories of Krynn, untold till now. the founding of Qualinost and the creation of a magnificient society of renegade elves, the Qualinesti. Kith-Kanan the first Speaker of the Suns can claim many triumphs, but is haunted by his failures and the mysterious behaviour of his son.